While perusing the shelves at the local Binny's, my eyes were drawn to a bottle that I've looked at and thought about before but just never pulled the trigger on. This time, though, I had no excuse. 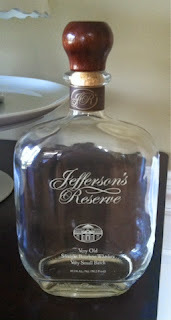 I didn't know much about Jefferson's Reserve, but as I understood, it is an Indiana company that barreled and blended bourbon sourced from Kentucky. Even that may not be completely accurate, I still don't know. (EDIT: Jefferson's was kind enough to thank me for my review and inform me that it is a Kentucky company sourcing American whiskey. I was clearly misinformed, but glad to have it cleared up as I wasn't certain in the first place). Nonetheless, I grabbed the bottle of Very Old Very Small Batch Bourbon. The name may seem a bit silly (almost as if it's trying too hard to tell the consumer this is something worth paying a few extra dollars for). However, the name/description aside, I found this to be a seriously good bourbon. This is a bourbon that I would primarily describe as buttery. It's somewhere in the middle as far as its body. It's not watery, but it's not too thick either. The flavor makes this bourbon, and it was honestly unlike any other bourbon I had. The buttery flavor underscored a nice blend of vanilla and cocoa. There's a slight hint of coffee, and the oaky wood-tone usually seen in more mature bourbons came through as well. I couldn't help but be reminded of white chocolate macadamia nut cookies. This was a bottle that I absolutely devoured. While I still have plenty of other bottles I want to try, I would not hesitate to grab another bottle of this. Granted, because they're produced in "very" small batches, there may be some change in flavor from bottle to bottle, but I'd be comfortable in taking that chance.